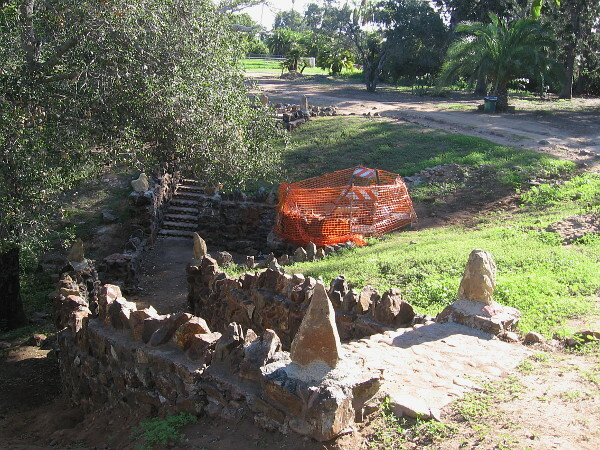 Balboa Park’s forgotten stone fountain grotto. – Beautiful Balboa Park! 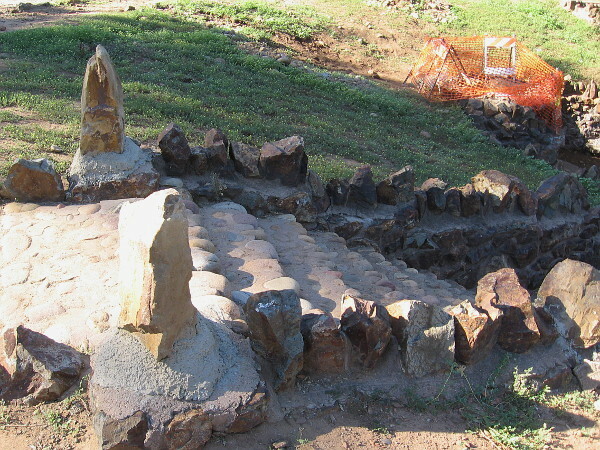 Balboa Park’s forgotten stone fountain grotto. Stony steps lead down into the historic 1907 Golden Hill Fountain Grotto in the southeast corner of Balboa Park. 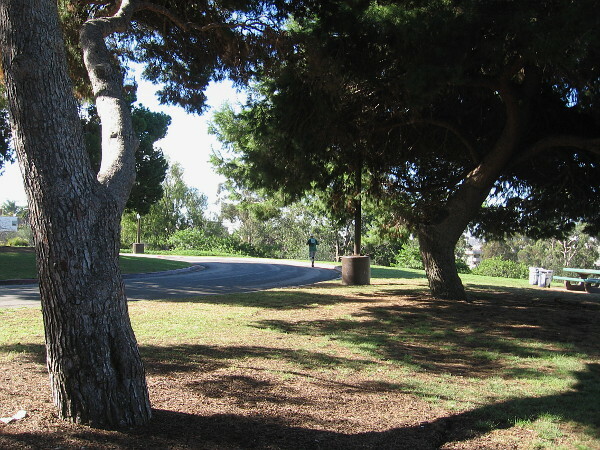 Several months ago I walked through a small section of Balboa Park called Golden Hill Park. Few tourists ever see this tranquil southeast corner of Balboa Park, but many who live on Golden Hill east of downtown San Diego enjoy recreating here. They play and exercise on the grass, eat at picnic benches, and gaze at vistas of the downtown skyline, Florida Canyon and the nearby Balboa Park Golf Course. They explore short hiking trails, enjoy palm trees and the shade of sprawling Moreton Bay fig trees, and jog or walk dogs around the small traffic loop. The development of this part of Balboa Park began years before the Panama California Exposition of 1915. Probably the most notable sight, now a forgotten, seldom-visited ruin, is a unique “fountain grotto” at the edge of a small canyon. The Golden Hill Fountain Grotto–which long ago featured an actual working fountain–was designed in 1907 by Henry Lord Gay, who also designed the famous Western Metal Supply Building which is now a part of Petco Park. 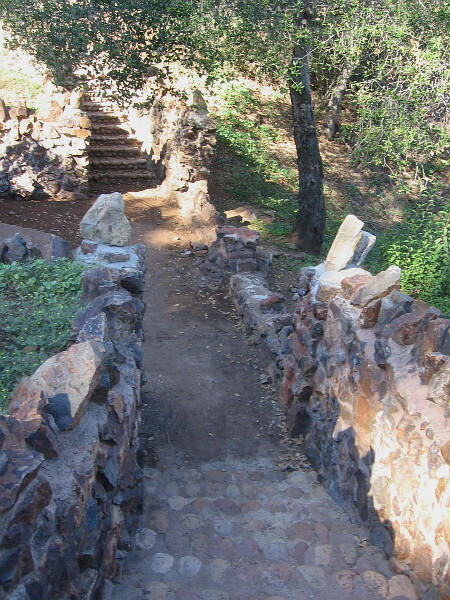 The rustic stone grotto was built in the Arts and Crafts architectural style. 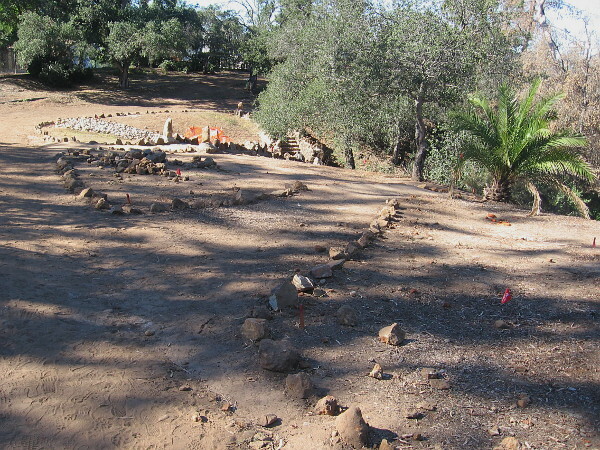 One can still walk down the sweeping stone stairs to the old fountain at the center, and imagine the inhabitants of San Diego visiting the grotto over a century ago. Today, the ruin is visited by very few: the curious, local walkers, the homeless, and those who happen to drift on by. 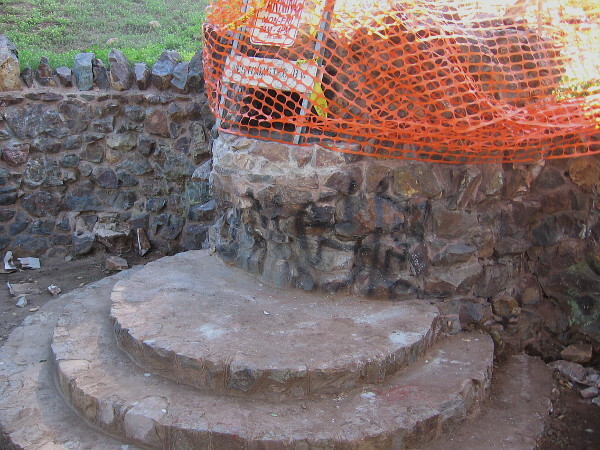 The long-forgotten fountain grotto can be found just off the traffic loop in Golden Hill Park. 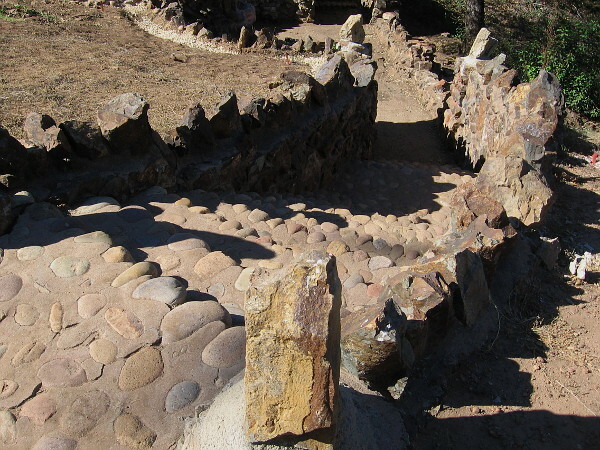 Heading down the decaying stone steps toward the center and a small, broken fountain. The rustic fountain grotto was built in 1907 in the Art and Crafts architectural style. The fountain no longer functions. When I took these photos, it had been fenced off due to disrepair. Sometimes the homeless gather around it. Rocks mark vague dirt walking trails around the fountain grotto site. 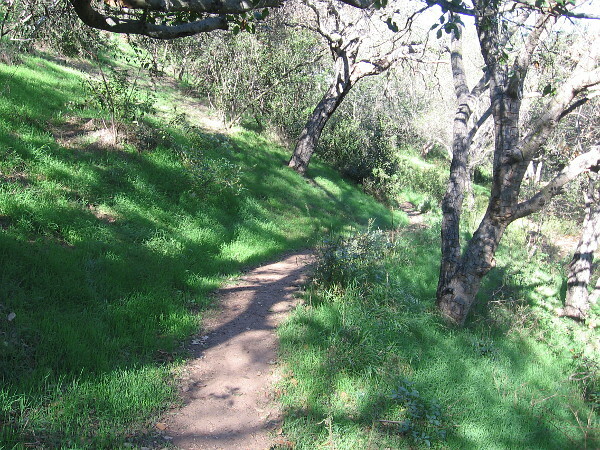 A hiking trail descends nearby into a narrow canyon. 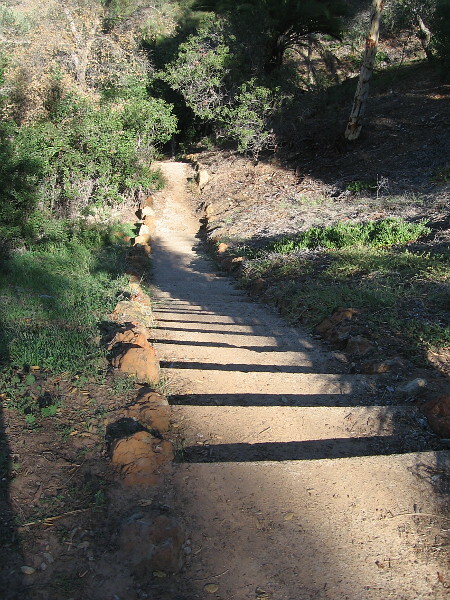 This canyon hiking trail in Golden Hill Park contains hidden beauty. As several piles of unfortunate trash attest, many homeless venture here. 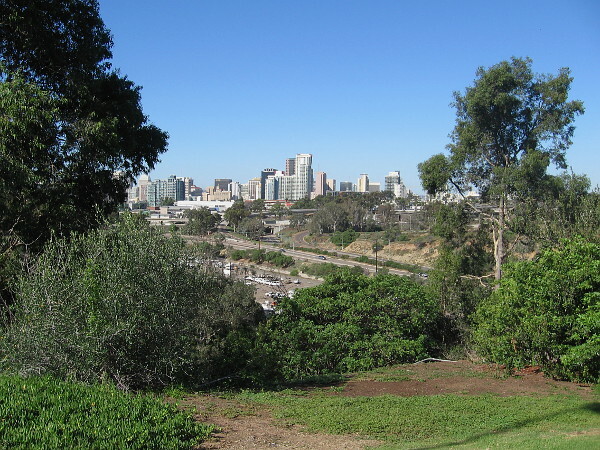 A beautiful vista from the edge of Golden Hill Park of downtown San Diego’s skyline. 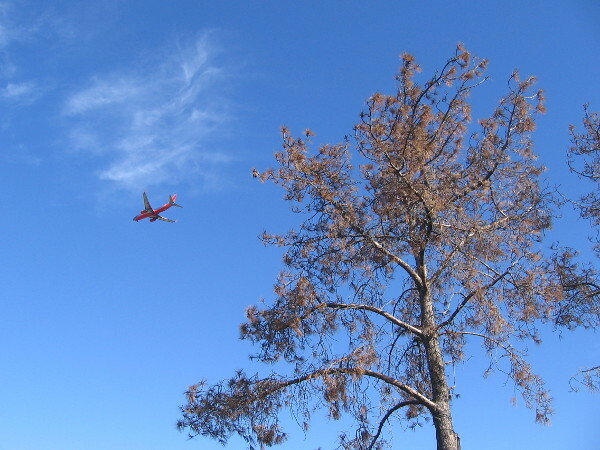 An airplane overhead descending over Balboa Park toward Lindbergh Field. 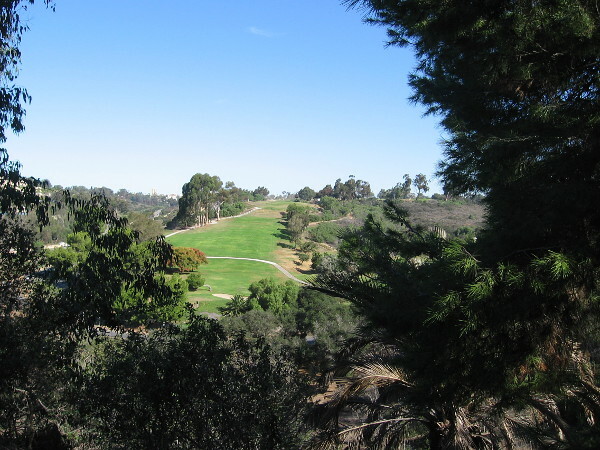 A scenic view from Golden Hill Park of the Balboa Park Golf Course to the north. Someone who lives in the neighborhood enjoys a beautiful day in peaceful Golden Hill Park. I’ve seen the road to this park on my way to see a friend in South Park. I’ll have to check it out. Thanks for the heads up. Previous Previous post: A new dawn of hope at the International Cottages. Next Next post: Free exhibit of contemporary Chinese art in Balboa Park.